Lunch is offered daily to all students at St. Gabriel School. In lieu of a hot lunch, children can choose to substitute a peanut butter and jelly sandwich or a chipped ham sandwich. Milk is part of the lunch, but can also be purchased separately for those children bringing a lunch. School lunches are $2.75 and milk is $0.35. 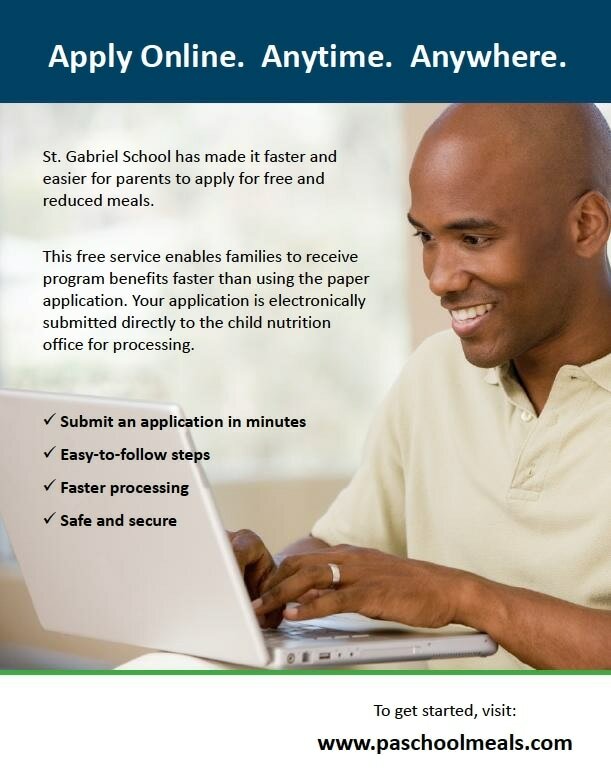 St. Gabriel School offers the free and reduced Federal Lunch program for qualifying families. Please read the file below for details about the St. Gabriel School Lunch Program for the school year 2018-2019. The Summer Food Service Program (SFSP) offers free, nutritious meals to children 18 years and younger during the summer when school is not in session. SFSP is a federal child nutrition program. There are approximately 2500 locations throughout Pennsylvania that serve breakfast, lunch and /or snacks. Many of the locations provide activities as well.